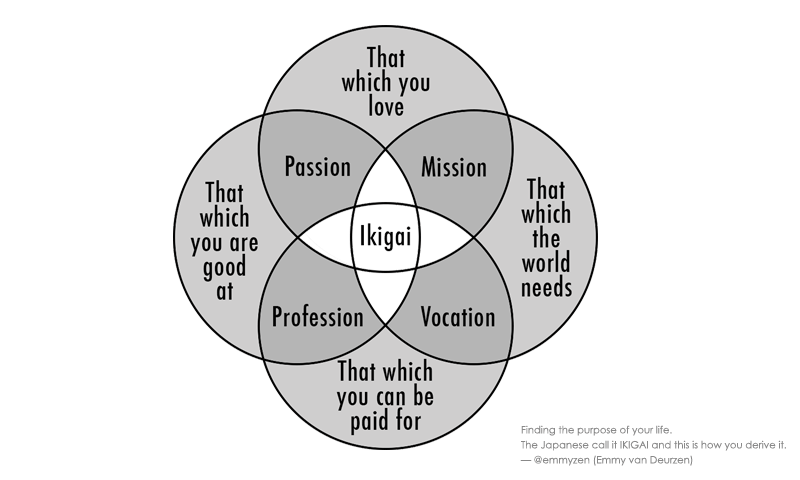 In a world where the search for meaning has become a crucial issue for many, the Ikigai concept, coming from Japanese culture, finds some resonance today. Ikigai is a Japanese word that means “reason for being”. Each individual has a hidden Ikigai that can be a great source of joy and give meaning to his life. We can imagine the feeling of fullness and accomplishment when finding our “reason for being”. But we still have to find it. What do the world need? For what can I be paid? But we can also apply the concept of Ikigai to entrepreneurship. Rather than wondering if my entrepreneurial project is good or bad, I can question his “reason for being”. In this context, the four questions above can then be a particularly relevant questionnaire grid for an entrepreneur trying to define (or redefine) his project. This is what I focused on. 1. Am I really interested and motivated by my project? It seems essential to answer this question positively. First, because we only have one life and engaging in a potentially long adventure I do not feel passionate about would be a waste of valuable time. Pleasure is also an invaluable engine, a vital source of energy to hold out on an entrepreneurial path, which is full of obstacles and difficulties. Choosing a project that I am not interested in is taking the risk of giving up by lack of resources. Finally, being passionate is necessary to attract talent and be convincing, first of all with my associates, but also with customers and employees. 2. Is my project a response to a need of the world? This question is equally important. Is my project the result of my imagination, a personal creation that I am about to offer the world or a real response to a real need of the world. If my project doesn’t find its origin in a need of the world, I need to make sure it focuses on it. You don’t need to consider the whole world, a portion of this world, be called a market, will be sufficient. But it is even better if the need is strong and if the individuals who need it are many. This question also includes the notion of utility in the world, which can be a powerful motivating factor. 3. Do I have the necessary skills to carry out this project? I also need to question my ability to execute. If I really like the idea and I think it makes perfect sense, I still need to execute it well enough for the needs of my customers to be satisfied. Do I personally have the skills and resources to be able to deliver the service or product that I plan to provide. If I don’t then can I acquire those skills? at what cost? and how long would it take? Can I attract talents who have the necessary skills, can I engage them, can I retain them too? It is important to be aware of our skills and weaknesses. 4. Is my project economically viable? Finally, It is essential to test my business model. Can my project generate enough revenue, profit and cash flow to be sustainable? Funnily enough, many entrepreneurs do not give much attention to the “monetization” of their project. Yet, selling is essential, this is what make your business strong and stable but also what confirm that your project is an effective response to a need in the world. And even a real need is not obviously converted into sales. So you have to investigate: Can my prospects pay for it? Will they be willing to? how much? Finally, when launching a business, it is sound to aim for a healthy financial balance without relying on hypothetical external financial resources (fundraising or sale to a large business). Of course, it is difficult to completely answer these 4 questions before you launch your business but it is interesting to ask yourself and continue to ask yourself once you started. Trying to figure out the Ikigai of your entrepreneurial project is about continually questioning it and reacting when the answers are not satisfactory. However, there are some pitfalls to avoid during our search for Ikigai. This should not be a fantasy quest towards an ideal, source of permanent dissatisfaction and we should also be careful not to confuse our entrepreneurial quest with our personal quest.